This book is a concise history of the use and interpretation of time, written by one of the foremost medievalists in Europe today. Arno Borst examines the various ways that time has been calculated by numbers and measured by instruments over several centuries, from the "computus"--an ancient method of determining times and dates--to the present-day computer. In a wide-ranging discussion, he analyzes the classical Greek concepts of divine, natural, and human time; the universal time of ancient Rome; the Easter cycle of the Middle Ages; the development of the mechanical clock in the fourteenth and fifteenth centuries; early modern chronology; and twentieth-century data processing. Borst argues that although many centuries and countless different instruments--sundials, horologia, abaci, astrolabes, calendars, and calculating machines--separate the medieval computus from the modern computer, each generation has had to answer the same question: how can we make the best use of our available time to improve our lives? The computer, he suggests, is merely a new instrument employed for an ancient purpose. Lively and accessible, "The Ordering of Time" will be welcomed by students and researchers in social and cultural history, the history of science and mathematics, as well as anyone interested in the history of time and numbers. 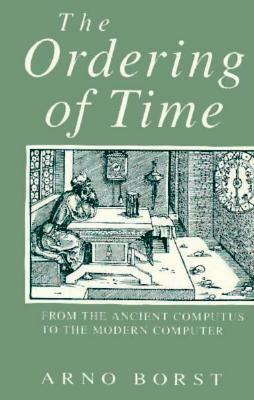 Description: This book is a concise history of the use and interpretation of time, written by one of the foremost medievalists in Europe today.Arno Borst examines the various ways that time has been calculated by numbers and measured by instruments over several centuries, from the computusan ancient method of determining times and datesto the present-day computer. In a wide-ranging discussion, he analyzes the classical Greek concepts of divine, natural, and human time; the universal time of ancient Rome; the Easter cycle of the Middle Ages; the development of the mechanical clock in the fourteenth and fifteenth centuries; early modern chronology; and twentieth-century data processing.Borst argues that although many centuries and countless different instrumentssundials, horologia, abaci, astrolabes, calendars, and calculating machinesseparate the medieval computus from the modern computer, each generation has had to answer the same question: how can we make the best use of our available time to improve our lives? The computer, he suggests, is merely a new instrument employed for an ancient purpose.Lively and accessible, The Ordering of Time will be welcomed by students and researchers in social and cultural history, the history of science and mathematics, as well as anyone interested in the history of time and numbers.Paperback. Pictorial cover. Illustrated. Frontispiece. ix, 168pp., index. Full refund if not satisfied.